Every Christmas tradition we have was invented at some time or another. Even the holiday itself was created by the Church so the pagans wouldn’t have all the fun under the mistletoe at the winter celebration of Yuletide. Much of our “modern” Christmas is a 19th-Century creation and we still measure the holiday against the Victorian ideal (albeit with Xboxes, plasma screens and iPhones, instead of hand-knitted socks and lumps of coal). And everyone knows the real Santa Claus was invented in the 1930s to sell Coca-Cola. Christmas itself didn’t even become a holiday in the United States until the 1870s. All you have to do to make a Christmas “tradition” stick is make people believe that it has been around forever. So, with that in mind and the Spirit of Christmas Past guiding me, let me present my family’s traditional roasted chestnuts. If you have a perforated pan designed especially for roasting chestnuts, great. But it’s ok if you don’t; roasting chestnuts in the oven is really easy. In fact, this is about as close to fast food as you’re going to get at Christmas. 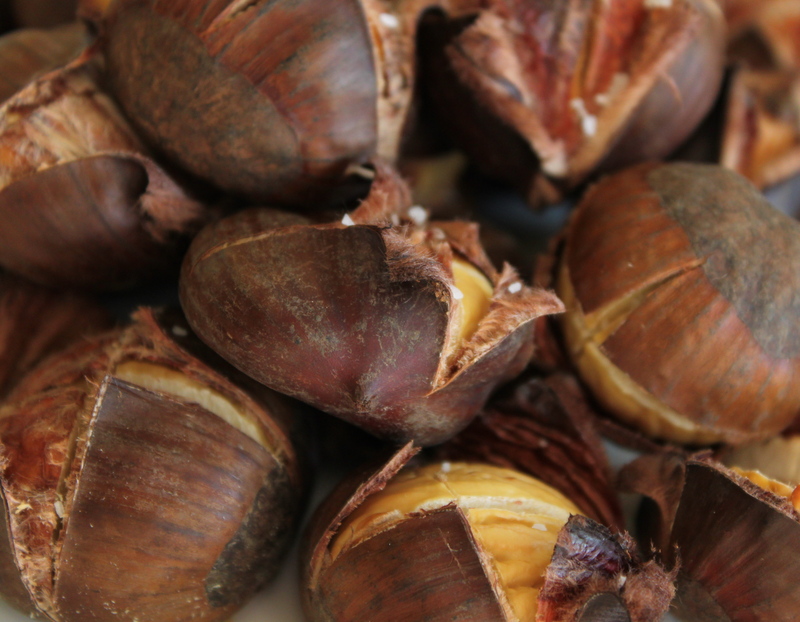 Simply preheat the oven to 425 F. The score an X through the top of each chestnut (make sure you do this on a towel or you will risk your fingers – chestnuts move around). Scoring ensures that the chestnuts won’t explode. Roast for 15-20 minutes (they will dry out if left too long), sprinkle with some salt and let cool until you can handle them. Peel and enjoy. And, if my kids tell you they have never had chestnuts before this Christmas, don’t believe them; they don’t know what they’re talking about – they still don’t believe in the Sugar Plum Fairy. This entry was posted in Snacks, Vegetables. Bookmark the permalink.